I have fallen in love with the application iColorama. There isn’t a perfect art application on the iPad, but iColorama has such a lot in it. It is more than just an application for applying filters to photos. In the Apple App Store there are a huge number of photo filter type of applications of varying quality. Some of them just apply a single filter which works over the whole of the image and doesn’t have any adjustment. While there are other photo filter applications for iOS that are more capable with layers and masks. iColorama will let you make the basic adjustments to photos, such as exposure, contrast and will even let you work on levels and more. 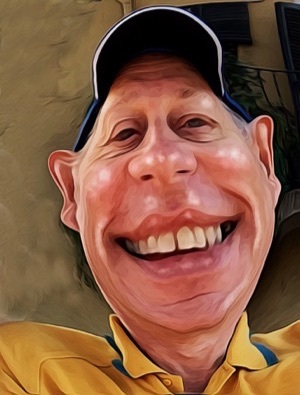 There are other applications that will do that part job easier or better, but there is enough in there to improve your photos ready for doing the real artistic work in iColorama. Take a photograph using the camera on your iPad or iPhone and get it into the iColorama application. I can also use Wi-Fi on my mirrorless Sony camera to import photos and work on them on the iPad. You can start with a blank canvas if you want to, but often it is easier to start with a photo you have on your photo roll in your Photos app. When you bring your photograph in, choose which resolution you want to use and in most cases you just might as well choose the highest resolution. I’m working with the iPad Air 2, but if you have an older model you may need to choose a lower resolution. Here is a photo I worked on in iColorama and posted to Facebook. The application only works in landscape mode, which is okay even though it is not optimal when you’re working with a portrait shaped picture. In the first menu Tone you have a number of menu items you can choose from to enhance your photo. Depending upon the adjustment you wish to use, you get a number of sliders, switches and presets to work with. With some of the adjustments you’ll be getting blend modes, allowing you to get a particular look with that specific effect. One such effect is Duotone and as well as the blend modes, you also have 40 presets. You get all sorts of weird and wonderful looks for your photos, mixing and matching the settings for the controls for these effects. There is a menu item for converting your photo to black-and-white and another one which will do the black-and-white plus one colour. So, the first step is to use these basic effects to improve the starting point for your photo artistic endeavours. It’s possible to go directly to the Form menu and choose something which is going to deform and alter your image so that it looks nothing like the original photo. For example you might use the Escher filter and make everything in the image spin. Same sort of thing if you use the Tunnel effect or the one called Deforms. Who knows, you might be just looking to create a fancy pattern using the colours available in the photo and you’re not bothered if it’s going to look completely unrealistic. We are talking about making art after all. In the Texture menu what you are doing basically is to overlay an image containing a texture. It’s possible to change the size and contrast of texture as well as choose the blend mode , rotation and hue. There are 170 different textures to choose from, some of them more useful than others. In any case, there is something in there for everybody, whatever your artistic temperament. With these sorts of applications it’s quite likely you’re going to want to combine various effects and processes as you create your artwork. When you have an application like Procreate, Art Studio or Pixelmator for iPad, it is really useful to have layers. Change the look of your image merely by reordering the layers in a stack. You’re able to keep the various processes and masking separated onto a specific layer with applications such as these. Unfortunately, with iColorama we don’t have layers. Not really a problem as you have workarounds allowing you to blend one image on top of another and use masking tools to specify where the effect is going to go. You do need to kind of know which order to use the iColorama effects in your process to get to your end point. Get this Book for free to read on your iPad, iPhone or Mac in iBooks. Because there is so much with these effects to configure and try out it’s a good idea to experiment. Try out a few of the different presets and see what they do, if you like something you can use the Save button. Bring the image back in later either to start fresh or to blend over something else you’ve done. Or what you can do, is to use the Apply button which will create a step in the process you can go back to at any time. So if you’ve applied something to the image and it’s not really working out with the next stage of the process, just go back to a previous point. Knowing iColorama and using serendipity. It’s a good idea to spend a good long time playing with application trying out all of the different effects. There is so much in the application it’s going to take you a long time. Start off with your favourites and gradually build on your knowledge of what the application can do. Join the iColorama Facebook page which is a community of artists in itself. You’ll find other digital artists using the application and quite often they will say what they’ve done in order to create the image they are showing off. You can take one of your own images and try to replicate the effects and learn as you go. You will often find there will be slightly unexpected effects happen with the combination of two or more iColorama effects. Sometimes it’ll just make your image look terrible and then other times you’ll think it looks fantastic. I think it’s great to find these serendipitous creations in your artwork and keep them if they look good. Keep on learning. Within some of the effects you can use brushes. There is a huge range of brushes available and you can also import extra brushes into the application. These brushes will also work with the masking tool. There is a brush menu giving you a number of brush tools. When you choose a tool like Bristle, it starts off with a completely white canvas covering your photo underneath. Choose one of the presets and start painting onto this white canvas for your painting to emerge. It’s possible to get a painterly effect and it is just like you are smudging the paint around on the canvas. Change the brush size, opacity and if you click on the icon with the word Set underneath it, you’ll find even more controls to play with. If you fancy going expressionistic with your painting, dial in some colour variation and size variation to the brush. It’s fantastic what you can come up with. To use with other iPad drawing and painting applications it’s quite easy. Simply use the Save button and save the image to your Photo Roll and then open up in the other application. Another way to do this, is to use the share option on the menu and then use the button for open in other app. The applications you can send your image to will depend on what you have available on your device. On mine I could send it off to ArtRage, Pixelmator for iPad, Graphic by Autodesk and a whole range of other applications. I tested this out by sending it off to ArtRage, I applied some paint, saved the digital painting to the Photos app and then I brought it back into iColorama. It all worked out okay, except that it didn’t come back in at the same resolution as it went out. The painting came back in at a lower resolution which depends upon the maximum resolution available in the other application you’re using. In some cases It’s not going to matter too much. With some artwork you’ll need to keep it at the full resolution so you have to be careful which other applications you use. Either that, or just keep all of your artwork within iColorama. There are a few possibilities within iColorama which will give you special effects. From the Style menu you could go into Style/Sketch and use one of the 12 presets to give you something looking a bit like a crosshatched pencil sketch. There is a switch in the bottom menu which will put some of the colour back into your image, or use in conjunction with the opacity slider to set up your picture. You can turn your image into just the blobs of colour by using the Style/Tensor effect. The Style/Flow effect is interesting with 11 presets each allowing you to change the level of highlight, shadows and bleaching. Within the Style/Painterly effect you have presets which will give you the Van Gogh starry starry night effect with the swirling of the colours. You have to be careful with many of these special effects of iColorama, as it is quite easy to completely destroy and obliterate a perfectly good piece of digital art. If you use them in moderation, then it could be just what you’re looking for, for your image. This application is quite marvellous in the right hands. I have seen some super examples of digital drawing and painting in the iColorama Facebook group. I’m very happy with what I’ve created myself working with my photos using iColorama. It’s a hugely flexible and capable application and just about any creative person could have a lot of fun creating digital art with iColorama. When I’m using the application to create my photographic art images, I’ll often end up with six or seven images I’ve saved along the way which I like for various reasons. It can be difficult for me to choose which one is the image I consider to be the finished one. I would really like to see the addition of layers within the application at some point in time. The brush settings are not bad but could probably be improved upon, for instance the developer could make it easier for choosing the size of a brush. These are minor inconveniences in an excellent application. The developer is active in improving the application showing off evidence of art creation using new tools in iColorama. The application can only go in leaps and bounds getting better with each new iteration. How to tell your own life story in a digital journal. How good is Day One App for journalling?